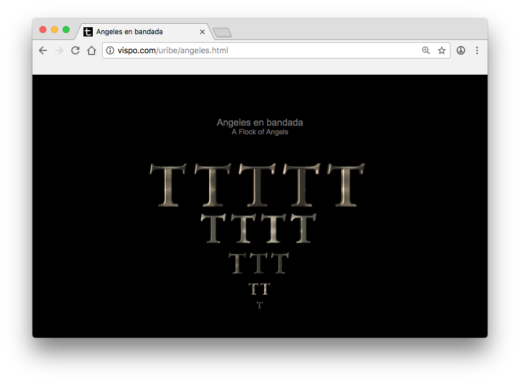 The component parts included here—four animated GIFs and an SWF—are not to be understood as independent works, but are to be combined in a browser to produce Ana Maria Uribe’s 1997 poem “Angeles en bandana (A Flock of Angels).” The poem arranges fifteen Garamond “T” characters in the form of an upside down triangle and animates them with out-of-sync bevels and inner glows. While this animation loops, so does a short piece of metallic-sounding audio titled “humhum.swf.” This and other Uribe anipoems are online thanks to Vispo. This title was included in Library Stack as part of the collection Open Font License, by Bryce Wilner. To access this object outside of a participating library, please visit the related link(s), or make a request. Contact us to learn more about our library services.